Just enough time for a quick photograph and the fish was off. Photo Monty Wright. Routeburn River. 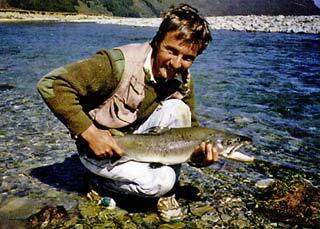 In 1992 the Otago Fish and Game Council changed the Routeburn River to a catch and release water. 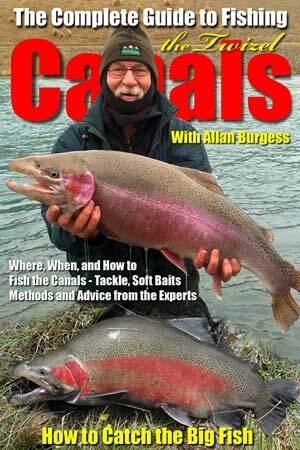 Some requests from interested anglers indicating that this water being mainly trophy fishery it should have this status. The Council’s staff then carried out survey work on the river, interviewing anglers and looking at the population numbers of the river. Having not fished this river for some years and decided to return there as I was holidaying in Glenorchy and staying at Glen-Roydon Lodge. On speaking with a friend, John Todd, who I was going to fish with for the afternoon, he informed me that anglers were very happy with this river being changed to catch and release water. We drove to the Sylvan Bridge which crosses the Routeburn River. It is on the walking track that takes anglers and trampers through to Lake Sylvan – a water with the opposite population – a lot of very small fish which has no size or bag limit it. Leaving our vehicle at the bridge we headed off downstream but had only gone a few metres when we observed our first fish feeding on the dark lines where the gravel meets the rock on the west side of the river. As we moved into position to cast for these fish they both immediately shied off and disappeared into the dark shadow against the bush line. This was very interesting as it was early in the new season and fish had hardly had the chance to get spooked too much. Lake Sylvan and other nearby lakes see Gems of the Wakatipu Basin.pdf from Otago Fish & Game (scroll all the way down the page). Moving on downstream we observed two brown trout lying behind a rock in an eddie, just taking advantage of the uplifted current caused by two large rocks. I again moved into position but, did not like the way the line would sit on the water so decided to cross the river below them and attempt to cast to them from the opposite side. The water depth was not great so I tied on a lightweight Hare’s Ear Nymph. My casting was accurate and I landed the nymph well in front of the fish so it would ﬂoat back through the metre zone and they could see it successfully. The first fish did not move from its holding position and just stayed there, swaying in the water. After several more casts still no interest was shown so I decided to take the risk before I changed and cast up in front and across to the fish lying on the other side of the rock. My first two casts were quite superb, even though I do say so myself, and I managed to knot line the first fish and get the nymph in front of the fish on the far side. The first cast brought no attention to the nymph but with the second cast, the ﬁsh slowly moved up and forward and then dropped underneath it. Although I’d got the nymph through the metre zone the fish chose not to take it, so something was not quite right. I immediately took off the unweighted Hare’s Ear Nymph and put on a Green Free Swimming Caddis, going back to the original fish with several casts, again without any notice being taken by the fish. Out to the second fish, and my first cast, unfortunately, fell a little short and I lined the first fish. It dropped to one side and slowly slid back downstream into some rough water. What a BBB-Bother. As this was happening the caddis then passed over the second fish, but unfortunately, there was no reaction from him. I first wondered if the cast may be just a little good as it looked like it just about passed over his nose. I decided to place the next cast slightly further to the left side. The cast, unfortunately, was a little short, meaning the nymph was going to pass down the right-hand side of the fish. There was little I could do about it at this stage but let the nymph pass on by. The inevitable happened – the fish immediately saw the caddis ﬂoating towards it. It moved to its right to take the nymph, which meant it was in a bad position for me to hook it successfully as it did so. I waited as the fish opened its mouth, took the nymph and started to straighten back into the current, but unfortunately dropping back as it did so. There was nothing left for me to do but lift the point of the rod to the left to see if I could set the hook. Unfortunately, it slid out the side of the mouth pricking the fish, and it swam off. John yelled from the far bank “Well you couldn’t have done any better than that”. I replied, “Well one bad cast and a lesson learnt – you should always get the nymph on the far side so the fish is swimming away from you when it takes it”. The Routeburn River 8 pounder. Photo Monty Wright. We moved off downstream John observing one fish as he crossed the river but he thinks the fish spied him first showing now interest. This was a large fish – about 7 lb. (3Kg) – a brown trout. We went further downstream and John started fishing a long shingle run. From the bank above it, he had located a large fish sitting right in the rough water and obviously working on nymphs as they drifted on downstream. Tying on a heavy weighted Hare’s Ear Nymph he showed his skills with the ﬂy rod by landing the nymph in the right place – to the left of the fish as it came down through the current. The dark brown shape immediately moved off and took the nymph. He replied, “Hard to say, but it’s over 5 lb. and it looks like it’s a jack fish”. It then appeared on my side of the river and it was certainly over 5 – more like 7 – 8 lb. I thought. I yelled out “He’s a lot larger than that. Play him carefully”. On cue, the fish immediately headed for the strong current below. John’s Hardy’s Sovereign bent extensively. I called back again “What weight tippet have you got on?” ”A five pound”, he replied, ”But if this fish is as big as you say we’ll have trouble with it in this current”. “I’ll cross over and see if I can assist” and moved on downstream getting below the ﬁsh and came back up. The fish decided to head back upstream and into the tumbling water where it was originally caught. John followed it and the battle continued. Typical brown trout jack he was – he bored and bored and bored back out into the hard, fast water and although John worked the rod with pressure to either side it had little effect on this large trout. Just looking at John’s face the determination was there to land this magnificent fish and he continued to play it with all his skills. I moved into position to assist him. He certainly didn’t like the look of me and charged back out into midstream – full of life again. Twenty minutes had passed and you could feel the tension in the air from John as he continued to battle the ﬁsh. Jokingly I said to him “Did you not tell him that this was a catch and release zone and you’re gonna let him go?” John said, “I don’t think he realises that you pop back into position and we’ll try and get him again”. As he came in this time he ﬂopped onto his side and with a wet handkerchief I picked him up by the tail. It truly was a magnificent jack fish. Obviously, it was a lake ﬁsh as it had very few spots on the whole body and had a greyish complexion. ”Just a second John, I’ll weigh him and take a couple of photographs,” I said and I produced the camera from my vest. People get very naive when you go to take a photograph as John said: “Don’t photograph my shoe” because it had come apart and his sock was sticking out the front. Being the devil I am I got him to hold the fish and you could easily see the shoe with a nice blue sock sticking out between the gaps. We weighed the fish at 8 lbs (3.63 Kg) and John held it in the water to release him. There was plenty of life in him I can tell you that because as he touched the water the tail went and he was off – not even a chance to get a good release photograph. John’s grin went from ear to ear and he was well pleased with his efforts. We returned upstream and spied a huge fish, which looked like a rainbow, in one of the holes. This hole looked to be about 15 metres deep but the ﬁsh was right at the surface. I called out to John to cast the nymph. He couldn’t see the fish for the glare on the water from his side but my Bill Bass Polaroids had picked the fish out very successfully. He cast the nymph and landed it with explicit skills right in front of the fish. It saw it and started to move forward, gaining momentum as it did. Just then the fly line became caught in the heavy current. It swung it from the fish’s mouth as he chomped, then chomped again, then one more chomp and another miss, doing a quick circuit in the water, it wondered where it had gone. He took off after it as he spied it again as the current spun the nymph around. The fish missed it again. By this time I had my head in my hands with despair and was prying to the lord. John had not seen anything except for one swirl in the water. How unlucky can you be? This fish was at least well into double figures. As I cursed our luck the trout slowly dropped down into the deep pool and out of sight. As we returned to the vehicle I saw a trout rise under the bridge. I cast the nymph – but my afternoon hadn’t gone too good. I landed it in the correct position. The fish rushed at it just a little fast and grabbed at the nymph on the way past. I lifted the rod tip into the air and again nicked the fish in the lip. It bounced several times on the surface of the water and swam off into the dark water at the edge of the river. The air was slightly blue, but that’s fishing. We packed up and headed home. It had been a very successful afternoon. I was convinced that this was an excellent catch and release water. All the angling skills are required to catch fish in the Routeburn and one word of warning – don’t go there if you haven’t got them! 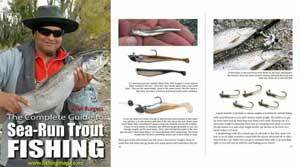 In Trout Fishing – A Guide to New Zealand’s South Island by Tony Busch, the author suggests that the rough terrain of the upper reaches of the Routeburn River are virtually inaccessible, though it does hold limited numbers of huge trout. He recommends a guide as the only way to reach the location. The Open Season for fishing in the Routeburn River and tributaries is from 1 November to 31 May. Fly fishing only. Catch and release only. 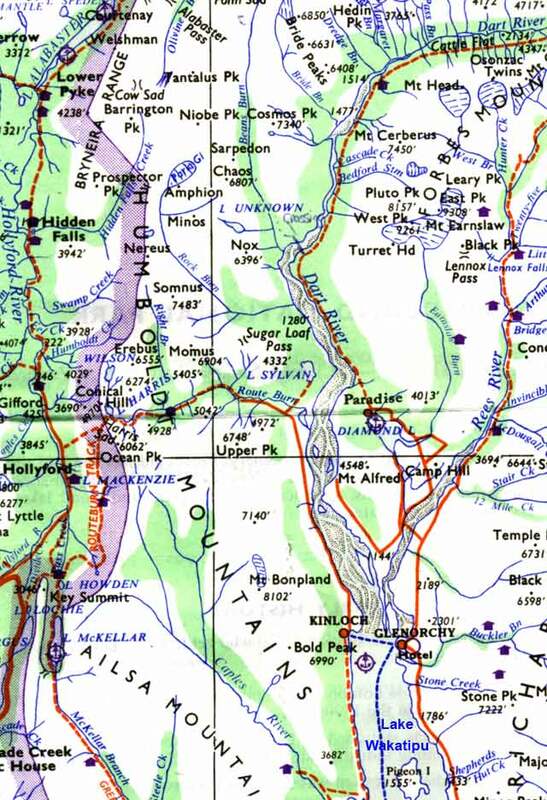 Please note this is a section of an old map from the Department of Lands and Survey N.Z, published in 1968. NZMS 122 Fiordland National Park. Crown Copyright Reserved. Obviously, some things will have changed since 1968. Notably, there is now a bridge over the Dart River which joins the Glenorchy-Routeburn Road and the Routeburn Road up to the Sylvan campsite and start of the Routeburn Track and affords better fishing access to the lower Routeburn River. The confluence of the Dart and Routeburn Rivers is approximately 12 km from the northern end of Lake Wakatipu. Tap map to enlarge.